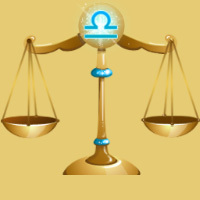 Libra people may look forward to a positive and progressive life this year. It will be healthy mix of financial status, progressive career and peaceful life. Some domestic issues need to be sorted out. This year, there will lot of acrimony in partnerships, whether in business or with your spouse at home. You will have to reassess your relationships, both professional and personal. There will be confusions in your mind about your job, charity services and health. You ought to be prepared for major changes in your domestic environment. This is also a good time to relocate. Even if you feel your family members are not appreciating your efforts for them, you should continue to do your duty. Make such kinds of investments that will reap benefits in your post retirement years. This year is very auspicious for selling and buying property. The health of your parents may be delicate, so you have to pay due attention to them. Your rapport with your spouse needs to be improved and for that you need to talk and communicate. Its a good time to relocate if your family has no objection to it. Entering new relationships can be a tricky affair for Libra people this year. Even if a new relationship begins, you will soon realize that its merely physical attraction and you are not mentally compatible with your partner. If you are in a committed relationship, then you may feel that relationship is financially burdensome to you, and hence you may re-evaluate it. Married couples may find it difficult to adjust with their inflexible partners. However, it would be only physical attraction that would keep the relationship intact. The intensity of love may be so intense that it may suffocate Libra people. This year, Libra people will be confused about the small health problems that keep plaguing them from time to time. You may be even confused abut your diet. Digestive disorders are quite common with you. It is suggested that for the small health disorders that you face, you may go in for homoeopathy or ayurveda instead of allopathic drugs. July to September is a slightly difficult phase from the health point of view. Apart from that period, no major health problems for Libra people are foreseen. Jupiter will be in your favor as far as finances are concerned but the North Node and Saturn may not let your financial situation stabilize. Hence, you may earn good money this year but you will not be able to hold on to it. It is necessary to have a positive and optimistic attitude for reaping monetary benefits and grabbing such opportunities. This year is favorable for business and expansion plans or joint ventures, especially the second half of the year. While reviewing your personal and professional relationships, try to be as objective as you can. Even if it is a painful and tiresome process, it will help you out eventually. Being too selfless or over compassionate may lead you to trouble, so you should avoid doing that. You should develop a more optimistic outlook, which will help you immensely.